Now, time for a bit of a surprise – back in the early 80’s, there was rumour of Software Project’s having internal competitions between developers to see who could get a conversion of Manic Miner and Jet Set Willy done first (and the best would get a release). Nothing was ever proved, until we got chatting with Chris Lancaster (coder of Manic Miner and Crazy Balloon on the C64) who mentioned that he was in fact working on a conversion. 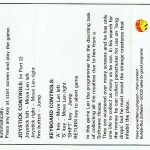 Software Projects had asked Chris to provide a version of his code so that they could demonstrate the C64 conversion at a US show. As Chris was not happy with an aspect of the game at that stage (the rope swing), so he refused. At that point, they got someone else to do the conversion without telling Chris (as we now know as Shahid Ahmad). 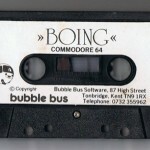 At one stage, Matthew Smith went on record by saying that the original C64 version was canned due to being rejected – but this wasn’t the case according to Chris. It was never officially rejected. Well, we know the rest – Shahid’s version was released and was a successful conversion. 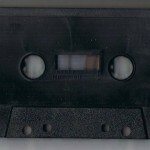 And what of Chris’ conversion? 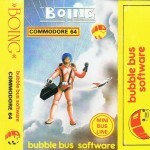 We basically asked Chris at the time if he had worked on any other C64 games that never made it, when he suggested a game called Boing! – which Chris gave a copy to someone but that was it. After looking by chance in Gamebase, we found an entry called Boing! and fired it back to Chris (thinking someone had leaked his game without him knowing). The credits though said “Stan Clear”. Then the surprise happened … Chris remembered that he had passed on the game to Bubble Bus with his blessing, just happy to give it away to anyone who would publish it. He provided several versions and never knew that they actually went ahead and published it. Looking around in the code found that there were several room references to Jet Set Willy! Boing! was in fact the original Jet Set Willy conversion with tweaks to make it unrecognisable enough to be sold under a different name! But interestingly as well as references in the code to original JSW rooms (we still need to hack around to see if they are playable! ), there are some very clever references dotted around! For a start, “Stan Clear” was a clever anagram of “Lancaster”. The main character “Len Wirmily” was an anagram of “Miner Willy”. “Rom Bammotty” was an anagram of “Tommy Barton” who ran Software Projects. The CL on the parachute was indeed Chris’ initials too. The game is pretty frustrating, as falling from a great height (like in JSW I guess) will mean instant death and a very slow playing death tune. It is frustrating to the point where it is almost unplayable. But it is great to see the original JSW leak out in some shape or form. From initial scans, there are no original JSW sprites tucked away, but there are bits in there like the room references at least. How about the game before it was turned into Boing? … Well, that is the next step – we hope that Chris may have kept his original conversion before it was turned into Boing – but its early days yet. Time will tell! “The first was ‘Boing’ which I gave away to quite a lot of people. It was originally going to be a conversion of Jet Set Willy but Software Projects got somebody else to do that conversion, without telling me, because I refused to give them my version for a software show in the US because I wasn’t happy with one aspect of it. Matthew Smith has gone on record as saying it was rejected by Software Projects but that is untrue, they were never given to option to take it as I wasn’t happy with it myself and needed to change a few things (the rope swing!). The unscrupulous Ron Bammotty is an anagram of Tommy Barton, the man with the cash to form Software Projects with Alan Maton and Matthew Smith! There was no competition to see who could complete their conversion first, I was asked to do it but when I hit a problem with part of the conversion due to the crappy way that Matthew Smith had written part of the Spectrum version, they quietly got somebody else to work on it without telling me. They wanted to take JSW to a show in the US but I refused to let them have my version as it had a serious problem that needed sorting out first and I was a bit of a perfectionist. I was in the RAF at the time and writing in my spare time so it was difficult to find the time to do it quickly, even though Manic Miner only took me 5.5 weeks to do completely so I wasn’t exactly slow! 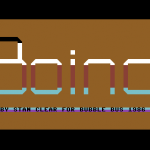 I’d best leave it at that for now – have to be up for work soon so best get to bed – but I’ll try to dig out some versions of Boing if I can find any and have a look for Sheep in Space while I’m at it although that was far from complete.